Tooth pain is annoying, troublesome, and frustrating. 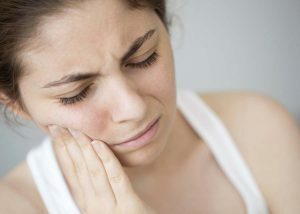 There are many reasons why you may be experiencing tooth pain, which is why it is extremely important to visit your dentist as soon as you start experiencing any unusual pain in your teeth. It is also important to go to regular dental checkups every six months to make sure your dentist can address any issues which may be affecting your oral health. 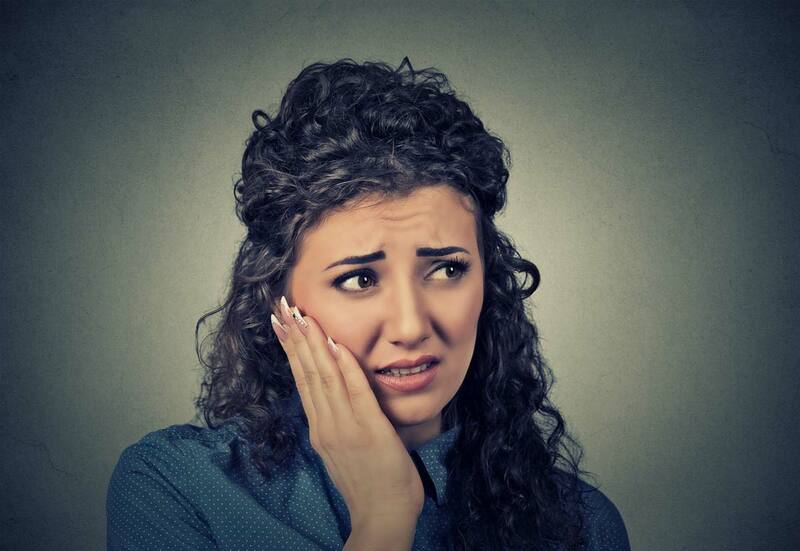 Tooth pain when chewing can be a sign that you have a dental problem or oral health issue. 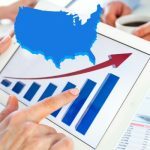 Some of these issues can include things like infection or even tooth decay. If you feel a sharp pain or any type of tooth sensitivity while you are chewing, you should visit your dentist to check that you don’t have any oral health issues which could potentially lead to even worse problems. When teeth are exposed to the various acids which are found in food and drinks, a person’s enamel can begin to erode. Enamel is the protective outer layer of a person’s teeth. When it is eroded, it causes tooth sensitivity and pain. Cavities and tooth decay can result in sensitivity while chewing. It is easy for bacteria and food to get into the internal parts of a decayed tooth. This can cause sensitivity and pain. Infections associated with root canal are some of the most common causes of tooth pain while chewing. A root canal infection occurs when a tooth is decaying and infects the nerve and blood vessels of a person’s tooth, causing sometimes severe pain when chewing. 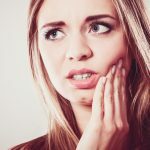 A tooth abscess is caused by a bacterial infection and results in the development of pockets of pus at the tip of a tooth’s root or in the gums. When pressure is applied to abscesses, it can cause extreme pain, which is why it could cause pain while someone is chewing. Damage to a person’s teeth like a dental crack or a loose filling can make it painful to eat. This is because structural damage allows bacteria to reach the inner nerves of a person’s teeth. There are many different types of treatment people can receive for tooth sensitivity or pain while chewing. Treatment would first begin with a thorough dental examination to determine what the underlying cause of the pain is. 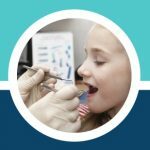 Once a dentist determines what the underlying cause of the pain is, they can then decide on the type of treatment to pursue to help reduce or eliminate tooth pain while chewing. Bonding is a type of restorative procedure which uses composite resin to repair decayed, chipped, or fractured teeth. Bonding can also be performed to close gaps in teeth. Crowns protect teeth which have been damaged, cracked, or broken and are placed over the part of a tooth which sits directly above the line of the gums. Teeth which have been severely damaged may require extraction. Fillings repair teeth which have been damaged due to injury, trauma, or cavities. A person who has periodontal or gum disease may have severe infections which can cause damage to their gums and teeth. Gum surgery may be required for these types of infections. Most routine checkups include oral cancer examinations. Patients are generally examined for tissue changes, discoloration and/or sores. Teeth which are diseased, abscessed, cracked, or decayed need to be opened up to clean out the tissue inside of the tooth that has been infected. Once the tooth has been cleaned out, the space is filled and the tooth is resealed. Dental sealants work by acting as barriers against bacteria which can cause tooth decay. They are typically applied to a person’s back teeth. Veneers repair chipped, stained, or decaying teeth and also protect the surface of a person’s teeth. It is extremely important to maintain a strict, regular, and consistent oral health care routine to ensure that your teeth are in good shape. Dental health issues can often lead to other severe health issues which can impact your overall health and life. Tooth pain while chewing can happen for a number of reasons. Some of these reasons can include cracked teeth, injury, decay, disease, infection, and many other things. This is why it is extremely important to get a regular routine checkup at the dentist every six months. Many people avoid going to the dentist because they find it bothersome and stressful. 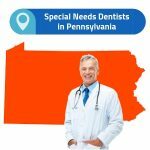 If you are anxious about visiting the dentist, talk to your dentist about it so that he or she can make the experience as comfortable as possible for you. As you prepare for your appointment, be sure to note down any other dental issues you may be experiencing, any medications you may be already taking, and any questions or concerns you have for your dentist. Remember, maintaining a good oral health regimen will ensure that your teeth are in good shape. If you notice that you are beginning to experience any pain or sensitivity while you are chewing, contact your dentist and schedule an appointment.